Raging Ravine is a level in the Ice World area of DK: King of Swing. It is one of the four levels that must be completed to access the world's boss level, Sassy Squatch's Lair. This level takes place on an icy mountain that must be climbed. Neckies and a single Kritter are the only enemies that inhabit it, but they can shoot or throw eggs or bombs at Donkey Kong (or Diddy Kong in Diddy mode) to hurt him. Other obstacles in this level include tires, barrels, mines, Rotatable Barrels, and moving peg boards. Bombs also appear for the first time in the game in this level, being used to break ice blocks that cover peg boards. 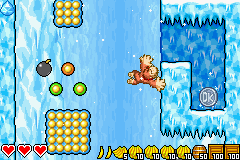 As most levels, a Crystal Coconut and a silver medal appear in this level. The first part of the level features many Rotatable Barrels that the Kong must use to shoot to the top of the area. However, tires and mines block his path, making it harder to progress. The barrels can be tilted freely, so he must aim as the obstacles get out of his way. Bananas are placed between each Rotatable Barrel, which are placed in a zig-zag-like path all the way up the area. After shooting out of several barrels, the primate can reach a pair of small peg boards that can be climbed to reach a ledge that leads to the second area of the level. In this section, two pegs boards can be seen next to a pair of single pegs. A rock is next to them, which can be used to defeat an egg-shooting Necky just ahead. A set of four peg boards are to the right of the Necky, and they move in and out of the icy, blue wall. The hero, whether it be Donkey or Diddy, must climb upwards with the pegs, trying not to bump into the wall as the peg boards near it. If he hits the wall, he might bounce off and fall. A rock and a lone Necky are to the left of the four peg boards. On a wall above this Necky, a lone peg board can be seen. It slowly emerges from the wall, and then goes back in soon after. It must be used to climb to another peg board on the opposite wall, which moves in and out of it. A Necky is between the two boards. Three more peg boards like this are above, each one on the opposite wall of the other. They must be used to reach a ledge that leads to the third area. A ledge holding a barrel containing a Crystal Coconut is to the left of this path. In the third area, there are five pegs next to a bomb. Two peg boards are above here, but ice blocks cover them. The Kong must destroy the blocks by throwing the bomb at them. Once he can grab onto the pegs on it, he can travel upwards to some single pegs that have another bomb next to them. A barrel sits in an alcove to the left of here, and if the primate throws the bomb into it, the bomb breaks the barrel. As a result of the barrel breaking, a peg board appears above. It can lead the hero to a few more peg boards with a trio of bananas near them. 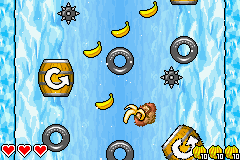 A Kritter swings on a peg boards on the opposite side of the area from these bananas, and it throws bombs at the Kong. With a moving, blue peg board, the hero can reach a pair of pegs with a bomb above them. If it is thrown into a nearby alcove with a barrel in it, it destroys the barrel, causing two small peg boards to appear above. A silver medal appears in the place of the barrel as well. The previously mentioned peg boards can be used to reach a ledge with an exit sign on it. When this is landed by, the level is completed. This page was last edited on April 5, 2019, at 12:49.